Rhodiola rosea — The world seen through rose-tinted glasses can become real. Rhodiola rosea is a plant native to high-latitude mountains in Europe and Asia. During several decades of research in Russia and Ukraine its constituents and actions have been explored in lab animals and humans and a number of active components have been identified. increased libido in both sexes. Animal studies have suggested that Rhodiola may have cardioprotective and anticancer effects, as well. A dose of approximately 120-200 mg daily is recommended, preferably beginning several weeks prior to a period of stress. Three times that amount is suggested when usage is begun immediately before or during a stressful activity. The dosages required for cognitive or libido enhancement are also in the 100-200 mg range. Rhodiola rosea is a plant native to high-latitude mountains in Europe and Asia. During several decades of research in Russia and Ukraine its constituents and actions have been explored in lab animals and humans. Active compounds identified in Rhodiola species include rhodioniside, rhodiolin, rosin, rosavin, rosarin, and rosiridin. 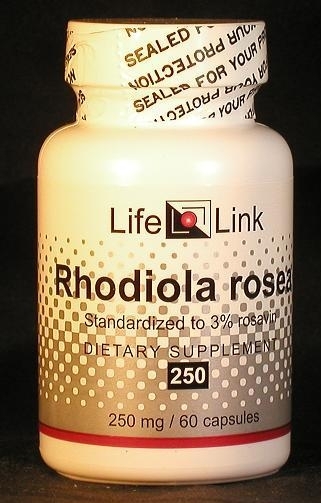 Rhodiola rosea species have been reported to offer generalized resistance against physical, chemical, and biological stressors — such as exercise, mental work, lack of sleep, and disease. For example, in a study of medical students during an exam period, those who used a Rhodiola extract showed improvements in physical fitness, sleep patterns, mental performance, motivation, and mood. Animal studies have suggested that Rhodiola may have cardioprotective and anticancer effects, as well. Rhodiola supplementation is also an effective elevator of libido in both sexes, according to psychiatrists at Columbia University. A dose of approximately 120-200 mg daily of a Rhodiola rosea extract standardized for 3% rosavin has been suggested, preferably beginning several weeks prior to a period of stress. Three times that amount is suggested when usage is begun immediately before or during a stressful activity. The dosages required for cognitive or libido enhancement have not been systematically studied, but are probably also in the 100-200 mg range.